WEIRTON — The West Virginia Department of Environmental Protection says that enormous black cloud that formed after the demolition of the old basic oxygen plant Saturday morning contained “mostly graphite and soot,” though not everyone is buying it. “After the demolition, the particulate that filled the air contained mostly graphite and soot, which had built up in the (plant) over the years,” said Fletcher , who pointed out an inspector had been on site “prior, during and after” Saturday’s implosion, and was back in Weirton Monday morning. 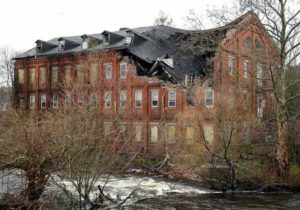 The entire site had been watered down prior to demolition, Fletcher added. 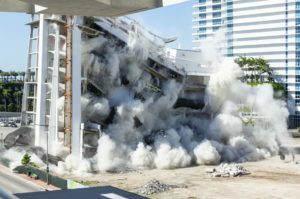 “Unfortunately, it is virtually impossible to perform a demolition of such an old and large structure without a good amount of particulate entering the air,” Fletcher said. But residents of the Weir Avenue neighborhood enveloped in the particulates have been concerned it may have contained dangerous heavy metals. In addition to coating their homes and vehicles, the force of the blast shattered windows throughout the Weir Avenue neighborhood, which allowed the ash to infiltrate the inside of homes in that area. Frontier promised to pay for repairs and cleanup related to the demolition and had crews on the scene within minutes after the blast. Nogay said he’s “looking at various options” on behalf of the property owners, and contends explosives weren’t a wise choice given wind speeds — from 9-25 miles per hour, with gusts as high as 33 mph — moving in a southeasterly direction Saturday morning, which put Weir Avenue directly in the path of the particulate cloud. “The city should never have issued a demolition permit that allowed them to (blow up) a 60-year-old plant site with all those heavy metals in windy conditions,” Nogay said. The Frontier Group of Companies, the current owner of the property, could not be reached for comment.